Editor's note: Mr. Munroe has been missing for several days. We have received no submissions from him for some time, but we found this single panel on his desk in a folder labeled 'MY BEST IDEA EVER'. It is clearly part of a work in progress, but we have decided to post it in lieu of a complete comic." Update: Apparently, Munroe is just fine. The latest strip is up on schedule. 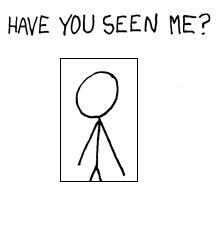 COMMENTS for RANDALL MUNROE MISSING?